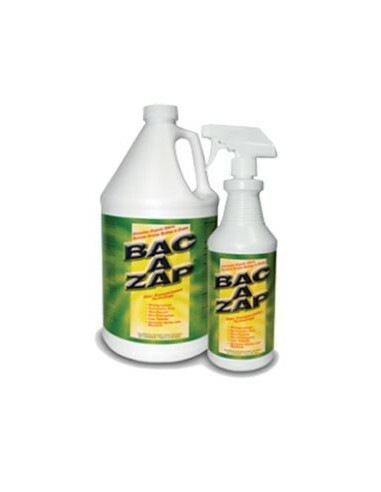 BAC-A-ZAP doesn't just cover up or hide odor, it stops odor at it's source! BAC-A-ZAP Odor Eliminator is a blend of natural organisms that work together to encapsulate odor, then consume the organic odor-causing matter. The process will continue until the odor is eliminated. 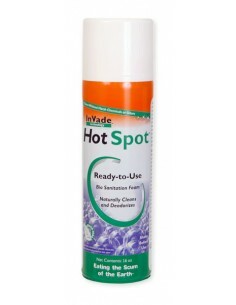 * Eliminates tough odors, even skunk! * Simple and effective against strong odors! General Application: Ready to use. If using as part of an ongoing maintainance program, BAC-A-ZAP may be diluted to maximize coverage. Bathrooms and Floor Drains: After cleaning, spray walls and fixtures with a 1+1 or 2+1 (water + BAC-A-ZAP) to prevent lingering odors. Pour 3-4 oz of undiluted BAC-A-ZAP directly into floor drains at the end of the day and allow to work overnight. Foaming: May be applied using an applicator device designed to create foam solutions. Place undiluted BAC-A-ZAP into applicator and do NOT dilute. Specially formulated to work with ProFoam Platinum foam concentrate and may be applied into drain lines, into wall voids, and onto sides of garbage cans and dumpsters. Refer to label for detailed instructions on different applications. BAC-A-ZAP eliminates odors caused by: feces, sewage, urine, vomit, smoke, mold & mildew, athletic smells, skunk, stinky drains, garbage, pet odors, dead animals, and food odors.